The epitome of comfort food. The indisputable superstar of hearty, filling, energy-packed meals. And probably the best leftovers ever. Enter: lasagna. In all honesty, we don’t make it too, too often but instead save it for when go on e.g. ski trips and want plenty of food prepared. This particular version got to come with us on our most recent voyage up north, and let’s just say it hit the spot like nothing else after hours and hours of skiing, a sauna session and a shower (that we were hungry for another snack just an hour later wasn’t the lasagna’s fault, but rather nature’s – if it hadn’t been so darn pretty, we wouldn’t have stayed out until sunset and thereby been a tad less famished. But hey, more nature AND double evening snacks? Bring it on). In true winter vegetable spirit, this lasagna relies on root veggies for its filling. We think the parsnip-Jerusalem artichoke-carrot combination is wonderful, but obviously know that ANY root vegetables you have on hand will do. Same thing goes for the beans in question – we love the nuttiness of brown/Pinto/cranberry beans (cranberry beans are called borlottibönor in Swedish), but any will work so look in your cabinets and see what’s lurking in the back, quietly begging to get used up. Instead of going through the process of making a béchamel sauce, we like to keep it simple sometimes and instead use oat crème fraiche (we use Oatly – no affiliation). It’s creamy, delicious and obviously plant-based. If you can’t find a similar product where you are, regular crème fraiche, sour cream or making a béchamel are all good alternatives (choose based on dietary preferences). That’s pretty much it for this keeper. A few weeks from now, another ski trip is coming up and we can guarantee several servings of this one will be coming with us as we go searching for mountaintops, cross country skiing tracks and all the other things we love so much. Hoping you all are enjoying winter to the best of your ability – and for those struggling, yesterday presented the first spring bird chirp as the sun reached our deck for the first time in months. It’s not here yet, but spring is definitely confirming it didn’t get the dates wrong this year either. Until then, let’s enjoy what is. Set the oven to 200ºC. Grate carrots, Jerusalem artichokes and parsnips using the largest holes on your box grater. Place in a bowl, and add in all remaining ingredients except lasagna sheets and cheese. Mix well. 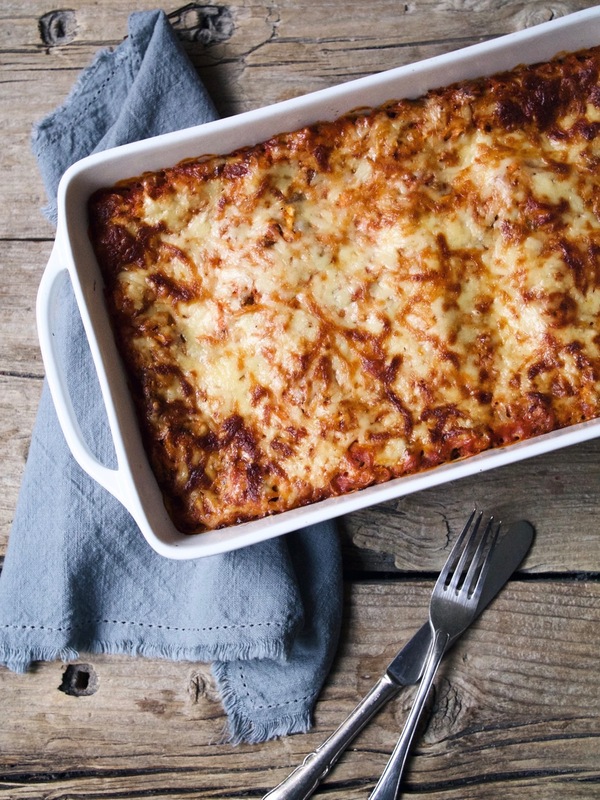 Grease an oven dish (roughly 20×30 cm), and then start with a layer of lasagna sheets. Then, spread out a layer of “sauce” on top. Repeat two more times, and sprinkle the cheese on top of the last layer of sauce. Bake in the middle of the oven for approx. 40 min, or until bubbly and golden in color. Allow to set for a little bit before serving. Sätt ugnen på 200ºC. Riv morötter, jordärtskockor och palsternacka grovt. Lägg rotfruktsrivet i en stor skål, och tillsätt samtliga övriga ingredienser förutom lasagneplattor och ost. Blanda väl. Smörj en ugnssäker form (ca 20×30 cm), och varva sedan lasagneplattor och grönsaksröra i tre lager. Börja med plattor och avsluta med röra. Sprid till sist ut osten på toppen. Ställ sedan in i mitten av ugnen i ca 40 min, eller tills osten bubblar och färgen är gyllene. Låt sätta sig en kort stund före servering. Mmmmm, sounds delicious. What a fun take on lasagna. I will be trying it soon! !